Why Does The Cycling Industry Need Research? 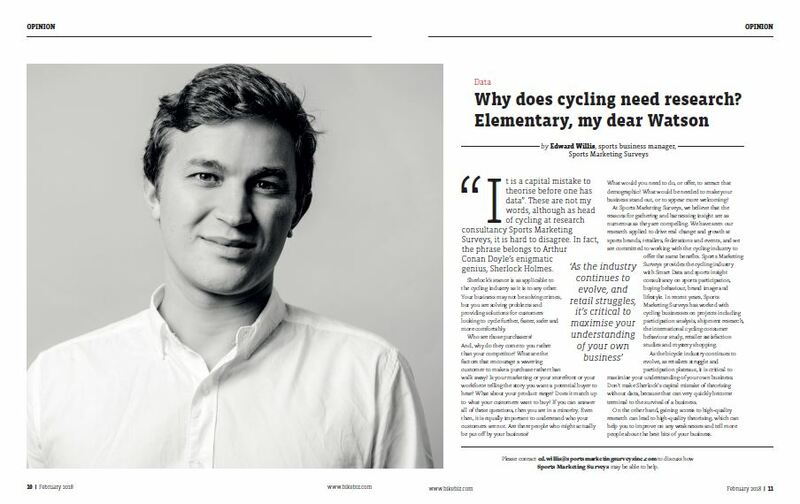 Elementary My Dear Watson | Sports Marketing Surveys Inc.
SMS INC.’s Edward Willis featured in Bike Biz‘s February Issue, discussing the value of Cycling Research. The article is reproduced below. To talk to us about how research could help you, please get in touch. “It is a capital mistake to theorise before one has data”. These are not my words, although as head of cycling at research consultancy SPORTS MARKETING SURVEYS INC. it is hard to disagree. In fact, the phrase belongs to Arthur Conan Doyle’s enigmatic genius, Sherlock Holmes. Sherlock’s stance is as applicable to the cycling industry as it is to any other. Your business may not be solving crimes, but you are solving problems and providing solutions for customers looking to cycle further, faster, safer and more comfortably. Who are those purchasers? Why do they come to you rather than your competitor? What are the factors that make a wavering customer buy rather than walk away? Is your marketing or your storefront or your staff telling the story you want potential buyer to hear? Does your product range match up to what your customers want to buy? If you can answer all of these questions, then you are in a minority. Even then, it is equally important to understand who your customers are not. Are there people who are put off by your business? What would you need to offer to make yourself stand out, or appear more welcoming? At SPORTS MARKETING SURVEYS INC., we believe that the reasons for gathering and harnessing insight are as numerous as they are compelling. We have seen our research applied to drive real change and growth at sports brands, retailers, federations and events, and we are committed to working with the cycling industry to offer the same benefits. As the bicycle industry evolves, as retailers struggle and participation plateaus, it is critical to maximise your understanding of your business. Don’t make Sherlock’s capital mistake of theorising without data, for that can very quickly become terminal to the survival of a business. On the other hand, good research can lead to good theorising, helping you to improve on any weaknesses and tell more people about the best bits of your business. SPORTS MARKETING SURVEYS INC. provides the cycling industry with SMART DATA and sports insight consultancy on sports participation, buying behaviour, brand image and lifestyle. In recent years, SPORTS MARKETING SURVEYS INC., has worked with cycling businesses on projects including participation analysis, shipment research, the international cycling consumer behaviour study, retailer satisfaction studies and mystery shopping. Please contact ed.willis@sportsmarketingsurveysinc.com to discuss how SPORTS MARKETING SURVEYS INC. may be able to help.